Presidents And Former Colleagues React To George H.W. Bush's Death While politicians praised his service to the country, former President George W. Bush called him "the best dad a son or daughter could ask for." Former Presidents Jimmy Carter, George H.W. 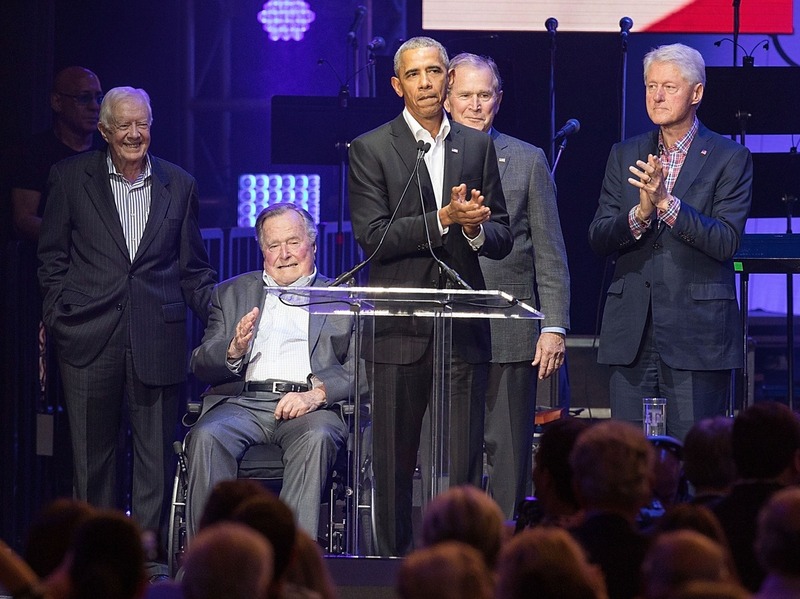 Bush, Barack Obama, George W. Bush and Bill Clinton came together last year in College Station, Texas. President Trump, who is in Argentina for the Group of 20 summit, offered praise for Bush, saying in a statement, "Through his essential authenticity, disarming wit, and unwavering commitment to faith, family, and country, President Bush inspired generations of his fellow Americans to public service to be, in his words, 'a thousand points of light' illuminating the greatness, hope, and opportunity of America to the world." He added, "President Bush always found a way to set the bar higher." Trump told reporters Saturday that he called the late president's sons George W. and Jeb Bush to express his sympathies. He and first lady Melania Trump plan to attend Bush's funeral at the National Cathedral in Washington, D.C. A state funeral is also being arranged. The president will designate Dec. 5 as a national day of mourning, White House press secretary Sarah Sanders said in a statement. Former President Barack Obama said, "America has lost a patriot and humble servant" and described the "tremendous good" Bush accomplished in his life — from helping new immigrants to reducing nuclear weapons and "ending the Cold War without firing a shot." Former President George W. Bush called him "the best dad a son or daughter could ask for." He said the family was grateful for his father's life and love and for the compassion and condolences of people who cared and prayed for him. In a statement, former President Bill Clinton described Bush's long record of service in the military, Congress, the CIA and as president, where he served from 1989 to 1993. "He never stopped serving," Clinton said. "I am profoundly grateful for every minute I spent with President Bush and will always hold our friendship as one of my life's greatest gifts." Clinton also penned an op-ed in The Washington Post on Saturday, writing that many people were surprised at their relationship "considering we were once political adversaries." Clinton defeated Bush in the 1992 election. He said Bush "could be tough in a political fight, he was in it for the right reasons: People always came before politics, patriotism before partisanship." Former President Jimmy Carter said the Republican's administration "was marked by grace, civility and social conscience." The Democrat added that through the Points of Light initiative that Bush founded, which promotes volunteerism, he embraced "a uniquely American volunteer spirit" and bipartisan support. Former Vice President Dan Quayle published an op-ed in The Wall Street Journal in which he reminisced about Bush's calm, kind character in the face of global changes and a Congress controlled by Democrats. "Traveling abroad, I also came to appreciate the reputation Bush had built over many years," he wrote. "Heads of government, even if they didn't know the president personally, knew they were dealing with a serious man with serious purposes. Whatever their angles or agendas, they never doubted the intentions or the word of the American president." Lawmakers added their own messages of condolence. Senate Majority Leader Mitch McConnell said, "His legacy will rank among the most distinguished statesmen our nation has ever produced." House Minority Leader Nancy Pelosi tweeted, "I am deeply grateful to his family for having shared such a wonderful man with us all. May it be a comfort to them to know that so many Americans mourn with them." She later called him "a gentleman of the highest integrity and deepest patriotism," adding that "his life and legacy will remain an enduring gift to the nation." Sen. Susan Collins of Maine described a U.S. Navy anchor monument in the coastal town of Kennebunkport — a gift from the community to Bush, who had an estate there. She said it was a fitting tribute, as he "consistently and vigorously demonstrated the values that are the anchor of American society. Courage, duty, honor, and compassion define our nation and his life." Secretary of Defense James Mattis remembered Bush's bravery as a naval aviator in World War II and how he used the experience to build a stronger world. He said in a statement that Bush's service to the nation "demonstrated how we as a people can draw on our humility, diversity and devotion to our country to meet every challenge with fortitude and confidence." Mattis also said that Bush's example "will long guide our Sailors, Soldiers, Airmen and Marines for how to live life without regret." But Bush didn't like to brag, according to Chris Buckley, who was a speechwriter for Bush. "When I was working for him when he was vice president, you couldn't get him to talk about his war record. And it drove his political advisers crazy because they'd say, 'My God, you've got a war hero here, you've got to oomph it up!' But if I put that in one of his speech texts, about how he was shot down at the age of 20, he would take it out. He could be maddeningly self-effacing but that was part of the reason you loved him." Top military leaders who served under Bush told NPR how much they would miss the 41st president. Gen. Brent Scowcroft, his national security adviser, said, "The world has lost a great leader; this country has lost one of its best and I have lost one of my dearest friends. I am heartbroken." Gen. Michael Hayden, the former CIA and National Security Agency director who worked on Bush's National Security Council, told NPR, "His decency, honor and kindness served as a beacon and should continue to serve as an example for people the world over. He was among the best of us, and will be sorely missed." In an interview with NPR, Colin Powell, who served as chairman of the Joint Chiefs of Staff under Bush, called the former commander in chief "the most qualified president to take over that office in our history." John Sununu, Bush's chief of staff between 1989 and 1991, told NPR that the former president helped reshape the world at a critical time, when the Soviet Union was collapsing. Working with Soviet President Mikhail Gorbachev, West German Chancellor Helmut Kohl and other leaders, he "tried to make everything win-win for everyone. And I think in an odd way, he made it look so easy that people don't appreciate how difficult a task he had." Richard Haass, who served as special assistant to Bush and chief Middle East adviser, told NPR how the president "invested in relationships, he worked with allies." Bush took other views into account and showed people respect, he said. "Someone like Gorbachev, one of the ways we avoided a nationalist reaction at the time in the dying Soviet Union was the president didn't dance on the wall when it came down. He showed real sensitivity to the Soviet predicament." German Chancellor Angela Merkel called Bush — who was U.S. president during the 1989 fall of the Berlin Wall — "one of the fathers of German reunification, and we will never forget that." James Baker III, former secretary of state and White House chief of staff under Bush, said in a statement that he led with "strength, integrity, compassion and humility" on the global stage and in everyday interactions. "His passion was a deep love of family and country." Early Saturday morning, Bush's second-oldest son, former Florida Gov. Jeb Bush, took to social media to write, "I already miss the greatest human being that I will ever know. Love you Dad!" The late president's wife, Barbara, died in April at age 92. An earlier version of this story misspelled the name of the former chancellor of West Germany. He is Helmut Kohl, not Cole.